Here’s my card for this month’s Reverse Confetti Sketch for You to Try. 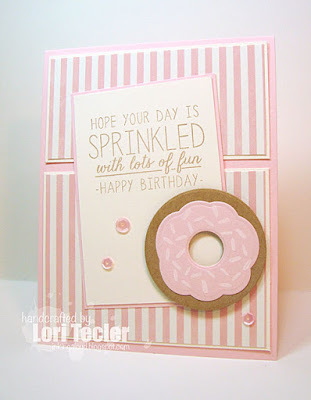 I put together a sweet birthday card using RC’s Donut You Know stamp set and coordinating dies. I used the dies to make a yummy iced donut. It was decorated with sprinkles stamped in white pigment ink. I used foam tape to adhere it to a cream panel stamped with the set’s birthday sentiment. The panel was matted on pink cardstock, then adhered to a pale pink card base covered with a pair of pink striped patterned paper panels. I angled it to add interest to the design. For a bit of extra festive birthday sparkle and shine, I added a trio of pale pink sequins around the donut. I just love the donut and sentiment. Great colors...makes me think of strawberry frosted.